Every so often, there comes a man who leaves such a mark on the world that it cannot be possibly measured. Rufus Burleson was just such a man. I will give a brief outline of his life but know this: the tiny spaces between the lines are filled with so many stories of faith, leadership, and pioneering spirit that I could have made an entire biography for each decade of his life. Burleson was born August 8, 1823 in Decatur, Alabama. There was little doubt that he would become a mason as his grandfather, William Leigh, had been the Grand Master of Alabama, founder of the city of Leighton, and charter member of Leighton Lodge #43 in the same state. 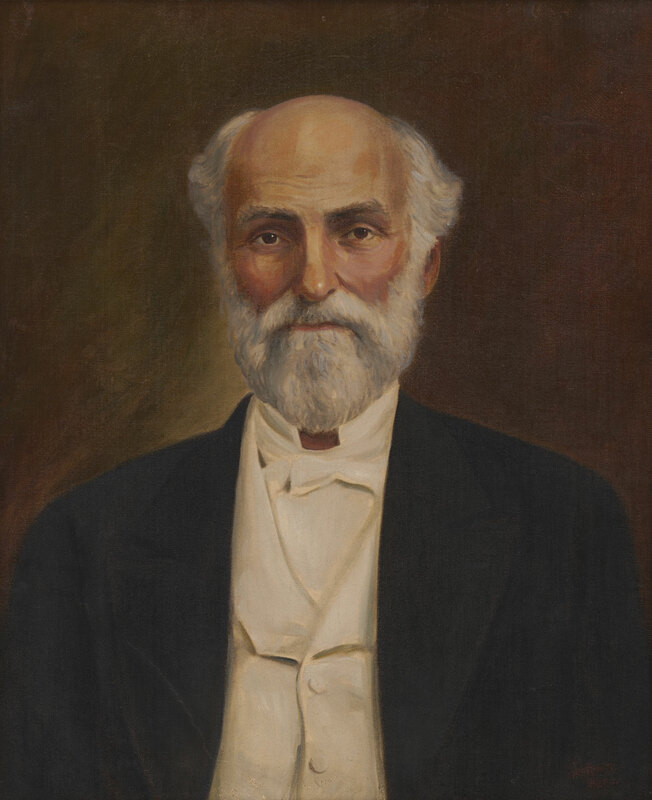 Rufus enjoyed a fine education and showed great promise as he hoped to become a lawyer but on April 21,1839, Burleson was baptized into the body of Christ. He later described those early years as being filled with doubt about God and if the following record of exemplary Christian devotion can serve as a sign of what may come of a doubter, it can be said that there is yet hope for even the most ardent of atheists. After studying for a year at Nashville University, he returned home in 1841 because of illness. While on the mend, he studied ancient languages, history, and scripture. During the early years as Baylor’s second president, attendance at the school far surpassed its previous marks and the university’s reputation was reaching thousands of miles further thanks to Burleson’s planning. Above all, he credited the wisdom of his wife, Georgia, for advising him and helping him shape up what Baylor would become. Though Burleson’s efforts for Baylor were successful, a local schism developed after Horace Clark, head of the women’s school, and Bro. Burleson could not reach an agreement over whether Clark should have to answer to Burleson as president of the university. The controversy grew and became so toxic that Baylor University was at risk of folding until 1861 when Burleson’s old student, Joseph Speight, wrote him a letter inviting him to Waco where he could fill the position of president at Waco University. On April 15, 1861, Bro. Burleson traveled to Waco where he met with Waco University’s Board of Trustees(then led by Speight) in order to negotiate terms. Upon accepting the position, Burleson gave a public speech to the people of Waco that was met with roaring applause and excitement for the immediate future of the young academy but within the month, most of the students and much of the staff were off to the Civil War so things did not take off quite as quickly as they had promised that day. Unlike many 92 men, Burleson’s involvement in the Civil War was minimal. He spent one year as Chaplain for Speight’s 15th Regiment but all parties agreed that society would best benefit by having him return to Waco for the purpose of cultivating education as much as possible in those strained years. Upon resigning his position as Chaplain, he recommended former Baylor student, Henry Renfro, to replace him. Renfro filled the position until the war ended and later named the city of Burleson as a tribute to Brother Rufus. When Burleson got back to Waco in 1862, he affiliated with Waco Lodge #92 and we still have the handwritten meeting records from that day. At the close of the war, life at Waco University again became vibrant. As part of the terms negotiated in 1861, Burleson had brought his faculty from Independence while Clark and his people remained there at Baylor with the women’s department. In 1865, the time for fighting was over and education was now on the minds of young men once more. Burleson believed that all people deserved to be educated and he expanded the school to be co-educational in 1866. This made it one of the first co-ed academic institutions in the United States. In addition to leading Waco University, Burleson also served as the lead pastor of the First Baptist Church of Waco for most of the 1860s and in 1866, he helped to establish the New Hope Baptist Church, one of the oldest African American churches in central Texas. With Burleson as its leader, Waco University and thrived during Reconstruction. It helped develop a city-wide community centered around Baptist ideals. By 1886, the old home of Baylor, Independence, was a shell of its former self and Baylor University relocated. The Female’s Department went to Belton and eventually became Mary Hardin-Baylor but the Burleson convinced Waco University to merge with Baylor’s Male Department. Most of the men involved with this entire process were men of 92. Baylor University, now in Waco, continued to thrive as it had since the war. The atmosphere of Baylor in Waco was about what you’d expect of a Baptist community. It encouraged avoiding a sinful life and the school really pressed those worthy ideals forward into the community much as it does today. A local newspaper publisher, William Cowper Brann, enjoyed a great deal of fame by writing critically about Baylor’s idealistic views and constantly published articles ridiculing faculty and citizens otherwise affiliated with the university. He had previously failed in many attempts elsewhere at writing an editing but finally, in Waco, he set himself up as a dramatic “news” reporter and a national audience soon waited to see what sorts of things Brann would accuse Baylor personnel of having committed in each issue. In addition to Baylor and Baptists, Brann often took aim at Episcopalians, black people and others. Rufus Burleson himself was not off limits. When Burleson adopted an orphaned Brazilian girl into his home, it was soon discovered that she was pregnant. Brann wrote articles accusing Bro. Burleson’s family of being responsible but an investigation into the matter proved the Burlesons innocent. Still, the scandal proved too much and Burleson was forced into retirement and given the title of president emeritus. This completed a remarkable tenure of 46 total years spent as Baylor and Waco Universities’ President. students in the women’s department. He even went so far as to call Baylor a factory producing prostitutes. As a result, the alumni and parents of students at Baylor were outraged. On April 1, 1898, Waco 92 Brother Tom Davis, whose daughter was a student at Baylor, approached Brann from behind near 4th and Franklin. He took out his Colt revolver and shot Brann who turned and fired off six bullets at Davis. Both men died the next day and in death, Brann achieved the legendary notoriety he had long sought. The score was not totally settled, though. After Brann’s burial, an unknown individual visited Oakwood Cemetery to fire off two more bullets at Brann. You can still see the marks on his tombstone to this day. Late in 1900, Bro. Rufus attended a meeting at 92 just as he had attended hundreds before since becoming a member of our lodge in 1862. He gave a splendid speech titled “Masonic Duty” in which he called for better attendance and activity at lodge. He would make it to just one more meeting. It is estimated that almost 10,000 students passed through the universities while Burleson was their leader. In the days that followed his death, businesses were closed, classes were cancelled and hundreds of the most influential men and women of Texas gave eulogies in honor of their old teacher, reverend, friend, and mentor. At the time, it was said to have been the greatest funeral service ever witnessed in Waco with just the speeches given by attendees lasting more than four hours. In 1881, one of Burleson’s former students and fellow mason Henry Renfro of Grandview Masonic Lodge named a new town in Tarrant County after Rufus Burleson. You can see the city on our map of towns named after members of Waco 92 by clicking here.